To my delight the sky cleared this afternoon, and I was even more delighted when I heard a familiar sound in the neighborhood. I hurried to the window and, sure enough, the pileated woodpecker was in our backyard. It didn’t hang around for long, but before it swooped through the air to land on a tree farther away, I was able to grab my camera and get off a shot. A visit from the big Woody Woodpecker look-alike is always a joy, and I thought to myself that I had my big bird photo opp for the day. But a little while later, Bob came home from his walk with Gulliver, rushed in the house, and announced, “Get your camera, and let’s go. The eagles are both at the nest.” So we took off for Bruce Yee Park, just a mile down the road from our backyard, where a pair of bald eagles have recently set up housekeeping. My longest lens really isn’t long enough to get great shots from much distance, but it was a delight to see this pair, Mama sitting on the nest and Papa standing guard in a nearby tree. I couldn’t get a clear shot of Mama. But Papa sat straight up and let me take multiple photo opps. They seem to be taking parenthood very seriously. Our recent weather hasn’t been conducive to photowalking, and I haven’t added many shots to my trailwalking gallery nor posts to my blog, but this afternoon’s two unplanned and unexpected photoshoots …both without leaving the neighborhood, made up for my recent photographic dry spell. I couldn’t have asked for a better day! Thanks for stopping by to see my big birds. Spring has been wearing its fickle face recently, bringing lots of rain, wind, and even a few rumbles of thunder. Thankfully we haven’t had any severe storms, although at times the rain was heavy enough to create a large pond in our neighbor’s backyard. This happens every spring, of course, and, without fail, when the spring rain comes, this mallard couple comes with it. A year or two ago, they were joined by several other male mallards, but that didn’t go so well. There was an outbreak of territorial jealousy accompanied by noisy quacking and threatening posturing. With multiple male mallards and only one female, peaceful coexistence was not a possibility. Watching their antics, I harbored a suspicion that the lady mallard was enjoying the ruckus…and maybe even egging the guys on! This afternoon Mr. and Mrs. Mallard returned for their annual visit, and happily it was just the two of them! I’m always delighted when I see Eastern bluebirds, especially when they are visiting my Backyard Bird Buffet. When yesterday dawned cold and soggy, I wasn’t expecting to see them, but as Bob and I watched the regular, daily visitors to the Buffet, a little flock of bluebirds joined the crowd and made themselves at home. First this little male visited the new seed cylinder. I didn’t see him munching at the cylinder, but apparently it also works well as a perch and a place to check out the activity in the backyard. …and he kept watch while she tasted a tidbit. Next they flew to the stump where they were joined by another female. Fortunately red-bellied woodpeckers are not a threat to bluebirds and other songbirds, so peace was restored in the Bird Buffet until a hawk flew in for a visit. At that point, all the guests at the Backyard Buffet scattered for safety. No one was left for the hawk to harm, so he flew away too. That’s the end of Tuesday’s adventures at the Backyard Buffet. Molting: more normal than you might think! When I posted a picture of this pitiful-looking bluejay on my daily photo site, some viewers expressed sympathy for him and his (normal, but sickly-looking) appearance. Molting, the process that causes some birds to lose their old, worn out feathers and get new ones, does leave the poor bird looking pretty sad for a short time. Molting, sometimes called shedding, is a process in which an animal routinely casts off a part of its body, either at specific times of the year, or at specific points in its life cycle. 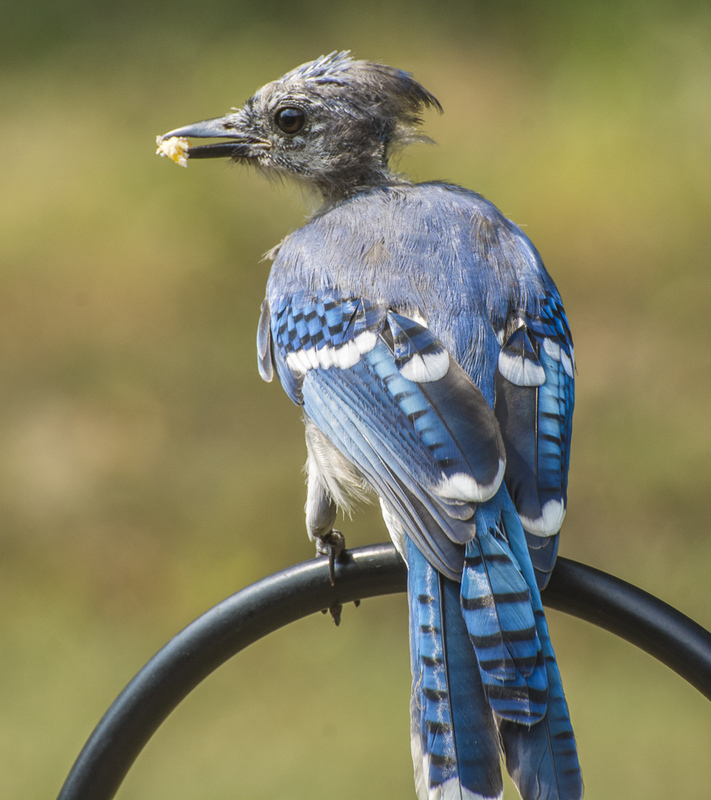 For some of us, who photograph birds, a bird like this bluejay may look alarming in the advanced stages of the molting process; however, it is a natural process that occurs regularly (often seasonally) in bird and other animals. Many pet owners, for example, will be aware of shedding when they must clean their dog’s or cat’s hair off the sofa or vacuum it from the floor. Shedding is a form of molting. Chickens are another example of animals that molt, which I knew, but I didn’t know they often stop laying eggs until their new feathers grow in. Another interesting fact I discovered is that salamanders and frogs shed their skin, and then often eat it. These are just a few examples of molting. Students of biology and people who regularly work with animals in the course of their daily jobs would probably take our bluejay’s scraggly appearance for granted, knowing it is caused by a normal process, but I didn’t recognize it for what it was. Now that I know (a little), I thought I would share what I learned with the rest of you. Thanks for reading this far. If you have anything to add to this rudimentary information, please join in the conversation by adding a comment below. See you along the trail soon. It’s been a great day for birding, considering the weather and the fact that I didn’t take my camera out of the house. Ten different species of birds visited my bird buffet today, and I got reasonably good pictures of eight of them…standing inside my kitchen window and aiming my lens at the birds as they flitted from feeder to feeder. That many different species would have been enough, but what made me happiest was glancing out the window and seeing the first hummingbird of the season, sipping sugar water from the feeder I had just filled. (Click a bird to scroll through the larger pictures). First hummer of the summer! Watching from my neighbor’s tree. That’s the lot for today. Unfortunately, the downy woodpecker and Baltimore oriole got away without waiting for a photo opp. Maybe they will visit another day, but I’m not complaining. It was a successful day of birding, and I did it all from inside my kitchen window! Thanks for stopping by. If you have time, leave a comment so we can have a conversation, or stop by my other blog and leave a comment there.